Sooooo, I had to wait for the hubby to get home and fix the problem. Turns out the new camera’s pictures take up some space. We got them a new apartment (I think it’s called a removable hard drive, but don’t quote me on that). Voila. Fixed! What were we humans DOING before all this technology? I vaguely remember the 80s… 😉 Remember when Atari and Print Shop was cool? No? I do. Oh yeah. The crouton recipe. Here ya go… This is a great way to use up bread that is past it’s prime. In a large bowl, toss bread cubes with olive oil until lightly coated. Add all the seasonings and toss until evenly distributed. Spread croutons in a single layer on large cookie sheets or jelly roll pans. Place in a 250 degree oven. After 30 minutes, toss lightly. Check the croutons every 10 minutes to make sure they’re not burning. When they’re evenly toasted. 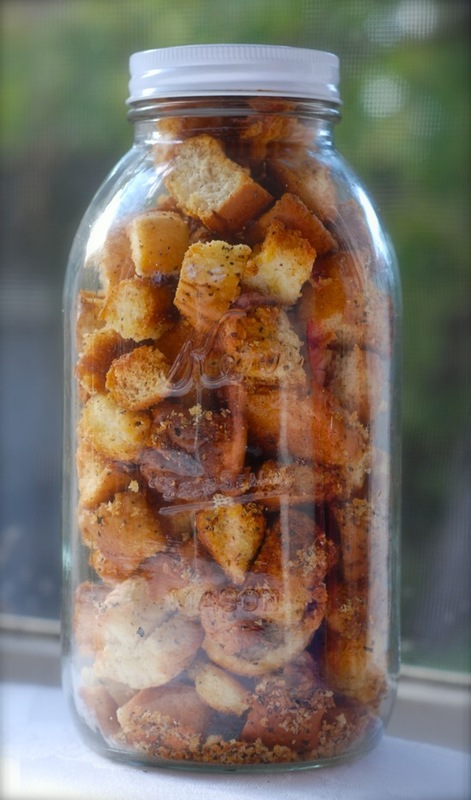 Turn the oven off and allow the croutons to cool and dry out for an hour or two. When completely cool and crunchy, place in air-tight containers. Enjoy on your favorite salads and soups!